The Hammerhead™ combines Lansky's popular 'V' shaped Tungsten Carbide and Ceramic Rod sharpening elements with a convenient bottle cap opener and beverage tab opener. The Tungsten Carbide Sharpener is ideal for lightning quick repairs and the Ceramic Sharpening Rods polish a finished edge in just three or four strokes. The Hammerhead™ combines Lansky&apos;s popular &apos;V&apos; shaped Tungsten Carbide and Ceramic Rod sharpening elements with a convenient bottle cap opener and beverage tab opener. The Tungsten Carbide Sharpener is ideal for lightning quick repairs and the Ceramic Sharpening Rods polish a finished edge in just three or four strokes. Swift repairs on kitchen, hunting and outdoors knives are simple when utilizing both sharpening elements. 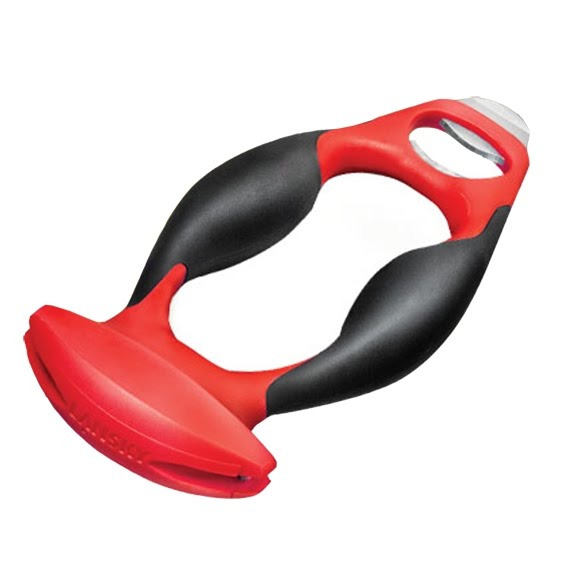 The ergonomic rubberized safety handle makes the Hammerhead™ both easy and safe to use for left or right handed individuals. The Hammerhead™ Sharpener is a great multipurpose tool for outdoorsmen and the chef at home, where cold beverages and a good sharp knife are essential. Perfect for camping, barbequing, tailgating or the home.